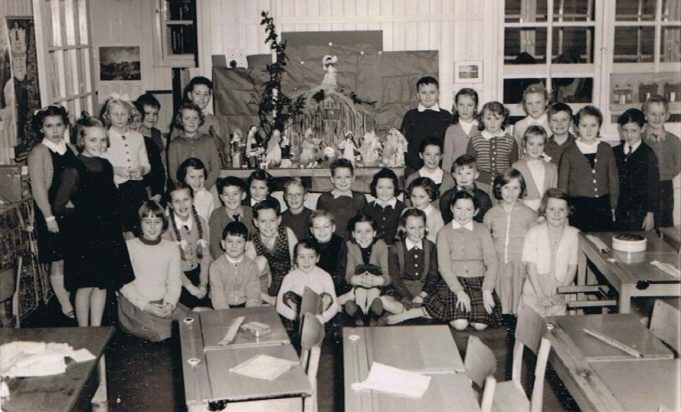 Following my recent comment on the Rushbottom Lane Primary School page thought this photo might be of interest. Since I attended from 1956 – 1961 I would guess it is from around 1958/1959. I am middle back row in front of the crib. In all honesty I cannot place any names to the other faces but maybe someone else has a better memory. I can still remember the faces and some names. I am kneeling in the front row in front of Neal Hambridge. I remember Alan Billham, Peter Houghton, who I am still in contact with, Lorraine Graham and Sharon Hinton. I now live in Flitwick which is 9 miles south of Bedford, off Junction 12 of the M1. Hi Allan, Remember you but must admit my memory for faces not as good; so know the names but cannot put a face to them. I still have Christmas Card contact to Arthur Taylor so will see if he can identify himself! I guess from your comment you moved to Australia at some point; I did not go as far only moving to Germany in 1980. I am still healthy and now a pensioner so theoretically a bit more time to look through websites. Happy to swap stories about the past years and can be contacted on Facebook / LinkedIn if wanted. Hi, the girl in the white top kneeling behind the girl with long plaits is my sister Sally Newman. I also attended this school from 1963 and also my eldest sister Stephanie Newman, we lived in Hatley Gardens and all have very fond memories of our childhood in Benfleet. Hi Peter, that’s me to your right. I think Sharon Hinton is kneeling on the left of the photo. Don’t recognise anyone else but Neil Hambridge (also living in Australia), Graham Patrick (or Patrick Graham), James Easter, Arthur (or Paul) Taylor must be there somewhere. You and I moved onto The Sweyne School and haven’t seen you since the early days there. Hope all is well with you.